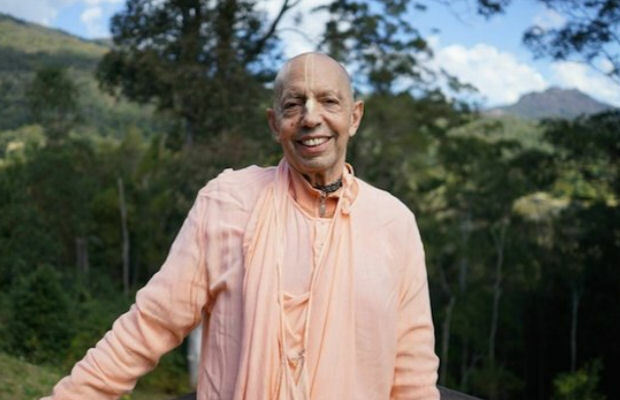 Update on Mukunda Goswami's Health ~ The Toronto Hare Krishna Temple! November 4, 2015 - Mukunda Goswami is making a slow but steady recovery from the surgeries. While in ICU he was looked after 24/7 by a team of doctors and nurses to make sure that his vital functions were properly restored. Their particular concern was Maharaja’s lungs (risk of a pneumonia) from extended confinement to bed due to the hip fracture as well as possible clotting. Therefore the day after the hip surgery physiotherapists started gently but forcefully encouraging Maharaja to sit up and then to put weight on his legs and walk with the support of a frame. This was (and still is) very painful and difficult for Maharaja, but is paramount for his recovery. On November 2 Mukunda Maharaja was shifted from ICU to back to a single room in the (Acute) Coronary Care Unit (CCU), where his operating cardio surgeon, orthopaedic surgeon and medical team daily check on him. Mukunda Maharaja’s medical condition is improving, although he still is in a lot of pain, aggravated by the need to sit up in a chair for his lungs rather than lie down in bed. He sticks to his regimen of regular deep breathing, arm, chest and leg exercises. Today's examination revealed less crepitation in his lungs as compared to Monday. As a doctor joked, “you have to dance for us before we can let you go”, and Mukunda Goswami, assisted by his servants, is determined to dance. Maharaja has increased his food and liquid intake, much to the relief of the doctors and devotees, as another concern with Maharaja’s post-operative condition was his undernourishment, low Hb, low protein and anaemia. Krsna-kirtana Das, his wife Malini Dasi (who both have a lot of hospital experience) and a few other devotees prepare prasadam according to Maharaja’s dietary needs & taste, which Krsna-kirtana personally serves (or sometimes lovingly administers) to Maharaja every morning and noon. This includes hot milk, fruit, high-protein whey drinks, homemade nut & wholegrain bread, as well as mung-dhal soup for lunch. On several occasions Mukunda Maharaja remarked to the nurses that “Hare Krishna food is much better than the hospital food”, to which they cannot help but agree. Whenever he can, Mukunda Maharaja is chanting japa on his clicker and listens to Srimad Bhagavatam read out to him by attending devotees and we also read The New Govardhana ‘Conch Newsletter’ cover to cover for him. He also showed keen interest in Shyamasundara Prabhu’s newly published book “Chasing Rhinos with the Swami”, remarking in jest that this might not be the most politically correct title for the environment-conscious Australians. If he maintains the same recovery pace, in a few days or so Mukunda Maharaja will be shifted to a rehabilitation facility at Murwillumbah Hospital near New Govardhan farm and, if his rehabilitation is successful, he will discharged and home in a couple of weeks after that. In the meantime, devotees are preparing his rooms at the farm for his special needs. Yesterday the tiled floor in his bedroom, bathroom and study, on which the fateful slip almost two weeks ago occurred, was treated by floor grip specialists to make it safer to walk on. Plans are to construct a ramp to the bedroom for Maharaja's easier access, arrange for a medical bed and chair, hand rails, replace all his socks with non-slip ones with rubberized soles, and install an alarm system which would allow Maharaja to call for assistance around the clock. Mukunda Goswami’s disciples express their deepest gratitude to the devotees around the world who offered their financial assistance for making these necessary arrangements for Maharaja’s residence.